War Legend and Yesterday’s Songs run at Flemington and Rhythm To Spare is across to Morphettville for the stable on Saturday. War Legend is the first to go in race three, the National Hall Of Fame Handicap over 1600m with Jack Martin claiming, reducing his weight to 57kg. It will be the second run this campaign for the five-year-old, who made up good ground late when resuming at Warrnambool on May 3. Mike Moroney is pleased with the softer track but concerned about the wide draw. “There is a bit of give in the track which will suit him but the wide draw from that start is a concern,” Moroney said. “The start will dictate how we ride, whether we go forward or back but we have no control over that. “He’s trained on well and the step up to the mile should be suiting him and if he brings his best form then he’s right in this I think. Yesterday’s Songs runs in race eight, the Colin Hayes AM, OBE Hall of Fame Trophy over 1400m with Patrick Moloney to ride from barrier one. Like War Legend, Yesterday’s Songs last raced at the Warrnambool May meeting when unplaced in the Wangoom Handicap. “The give in the track is going to help him and if we did get any further rain then that will be even better,” Moroney said. “Drawing the inside should help him - in the Wangoom he had to go back from a bad draw and that didn’t suit. Rhythm To Spare (pictured) returns for another tilt at the R A Lee Stakes (Gr 3), a race he won in 2014, finished unplaced in 2016 and finished third in last year. The eight-year-old has had three starts this preparation and Moroney says has several things in his favour. “He’s drawn nicely in two and Damien Oliver in the saddle so he’s got a bit going for him,” Moroney said. 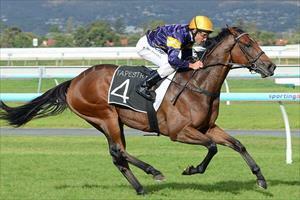 “It’s a strong race for sure but Rhythm is well suited by the weights and he’s flying at home.